The Clipper lighter company was founded more than 50 years ago in Spain and has since become one of the top brands in Europe. These handy lighters feature a removable flint housing that has an attached poker tool. This poker tool comes in handy when packing hand rolled cigarettes to assure your blend stays packed inside for a continuous smooth burn. 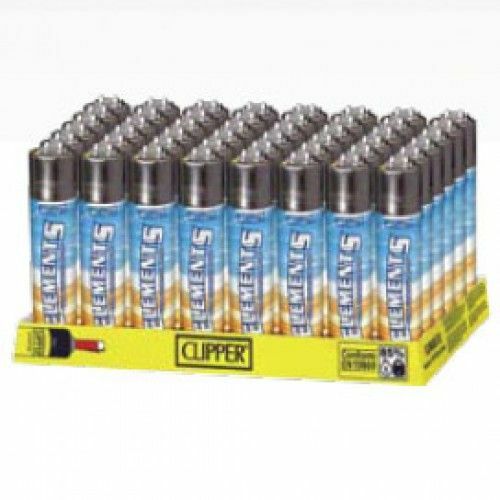 These clipper lighters have the Elements brand logo on the side to show you support proudly. This box contains 48 Elements branded Clippers lighters. Don't need a full box? We also have Elements Clipper Lighter Single Packs.